The comeback of the vinyl industry specific to electronic music or otherwise is definitely a welcome breath of fresh air for a music sales sector that was reaching a familiar point of saturation. The ease of availability of digital music has damped the feeling of mystery and novelty that usually accompanied the collection of music on physical mediums. The sudden popularity of vinyl has as much to do with the overall saturation of digital music in all its forms and the feeling of holding a rare piece of music in your hand. In fact, Forbes magazine had projected that in the year 2017, vinyl sales would touch a total of 40 million units worldwide in total. Probably the ‘Walmart’ of the electronic music world, Juno houses a huge catalog of vinyl-only releases. From House and techno to breaks, trance and even ambient, this is a one-stop-shop to pander to all your needs. Their extremely affordable delivery service is easy on the pocket but is certainly not easy on the heart as the cheaper services generally come without tracking number that can be a bit of a pain in the backside. Customer service, however, is prompt and responsive. Also here’s a tip, Juno is one of the few online record stores with a massive back catalog of old music releases that you can still snag at cheap prices! One of the biggest online record stores in Germany, Deejay.de is a site that is frequented by almost everyone with an affliction for wax records. The vinyl-only retailer also has a physical store where interested buyers can hear actual records on players before they purchase them. Deejay.de is also popular as they usually cover a large spectrum of house and techno releases and sell music from both well-known and lesser-known record labels from across Europe. They also have their own pressing plant and press records for at-least 500 labels worldwide. Their delivery charges are expensive although the packaging and the tracking of deliveries are far easier than most. This is because Deejay.de have their own patented vinyl delivery box called the ‘Vinyl Guardian’, that guarantees that your records reach you safely. Based in London, Phonica is another old-school record store renowned for housing the more eclectic side of electronic music along with the usuals. Another website that also has a physical store presence which is regarded by many audiophiles as a city icon that definitely is a must visit if you happen to be in ‘the old smoke’. The store also curates its own record label titled ‘Phonica records’ that has released music from the likes of Roman Fluegel, Psychemagik, Midland, Paul Woolford and Mr.G to name a few. The only downside to Phonica is the payment mechanism on the site. Goods can only be shipped to the address mentioned on the billing information that’s provided. This basically means that orders sometimes will not bear your own name if they are shipped anywhere else but to you. Those who play on the 12″ will certainly recognize Hard Wax. Regarded by many as the best in the world and and scorned by some, the store was founded by Mark Ernestus and Moritz Von Oswald who a better known as the legendary dub-techno duo ‘Basic Channel’ ( Your mind must be blown right about now). This vinyl dispensary was regarded as the original Berlin-Chicago-Detroit axis that was responsible for the rapid spread and popularity of house and techno in Berlin. In some ways, Hardwax is more than iconic, it is a part of electronic music history. 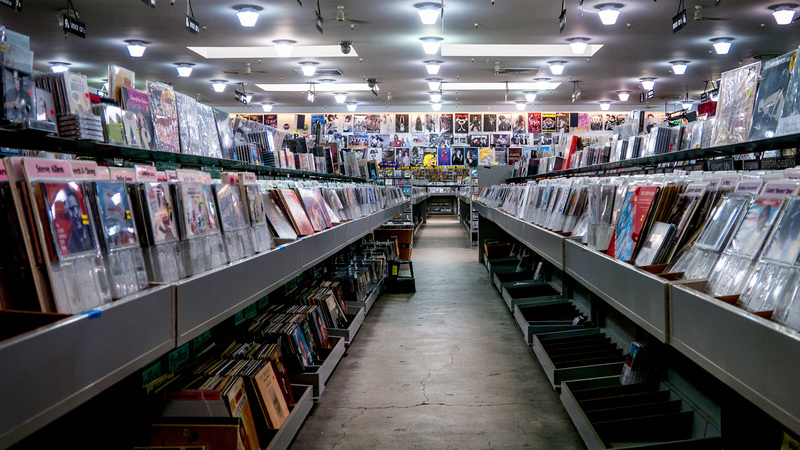 Snapping back to present day, the store is renowned for selling mysterious, unknown and often uncredited music on white labels that would only be available at the store in most cases. Don’t expect much help from the crew though, they are known to be pretty hard-nosed. Clone.nl is a vinyl record shop, online web-store, and record label based in Rotterdam, Netherlands and is also regarded as one of the best stores worldwide. They are known for their inclinations toward dub techno, house and electro as well as really functional and sophisticated techno or ‘Scandinavian techno’ as it is more commonly referred to as. Clone regularly organizes in-store vinyl sessions with accomplished DJs such as Mall Grab, Danny Daze, Legowelt, and Funkineven along with vinyl listening sessions for their latest releases. They even have a ‘Clone Store Only’ label as well, further underlining their exclusivity. If you ever have a chance you visit/order from this infamous record store, we suggest you go through their entire catalog. You will definitely unearth some absolute bangers! Riding the current wave of alluring and hypnotizing micro house is the rapidly rising label, record store, artist collective and agency Yoyaku. The crew has created a niche for themselves and the sound they promote which is inspired by the current Romanian minimal movement. With artists and well-known residents such as Oshana, Janeret, Lowris & Varhat patrons of the store themselves, it’s not hard to see why Yoyaku is gaining in popularity. In-store live streams are more or less the norm for record stores who want to showcase their stock and this one is no different. House, disco, funk and rush hour as are as inseparable as two peas in a pod. The legendary brand has been synonymous with being a crate digger’s delight since 1997 when it was founded. From being a handful of like-minded individuals wanting to listen to the best music the world had to offer, Rush hour bloomed into one of the biggest record labels in the world holding showcase nights at festivals, clubs, and record stores. The being said, the store also houses rare DJ gear and accessories that are hard to find else where such as the Phonon single-ear headphone. Last year, the imprint also made their mark in India with one of their residents Bezier, who performed at the Magnetic fields music festival. The store trades or buys used and unwanted vinyl at reasonable prices and many times, some of them have even returned home after traveling about in a DJs bag for years. A listicle about record shops can never be completed without mentioning the behemoth that is Space hall. Located in Berlin, Germany, this waxed out warehouse houses 12 inches from every kind of relevant electronic music genre out there in the musical cosmos. Originally starting out as a small cafe with a pair of CD machine and turn-tables, the outlet quickly grew by occupying and acquiring neighboring properties and eventually grew into a massive space. What’s impressive about the store is that they have always maintained the quality and quantity of their stock flawlessly through the years. This could be considered as a last resort for any piece of music that is incredibly hard to find and more often than not you are never going to leave the store disappointed.